Use a green flight card for any multi-stage rocket and you will entered for a draw from the prize pool. Note: We depend on everyone’s good judgement about keeping their rockets safe and stable and on-the field. Most but not all multi-stage commercial kits are good designs. If you are scratch building be sure to research the principles and tips that will keep your rocket safe and stable. We will require a check by a RSO for multistage stage rockets at this launch to identify rockets that should not be flown or need to be flown at the away cell. Low power multi-stage need an RSO by a Level 2 club members. Mid and high power need an RSO by a Level 3 club member. Every multi-stage rocket is a HEADS-UP Flight. So keep your eyes on the rocket and remember the booster will be decending separate from the sustainer. Gary Goldenbaum’s cluster two stage. CHAD staged C6-0 to C6-3. 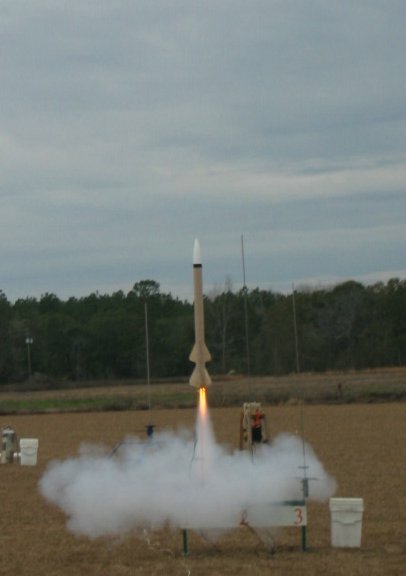 You are currently browsing the SouthEast Alabama Rocketry Society weblog archives for June, 2009.